January 2016, Happy New Year! PBQ's first meeting of the year started off with a great Show and Tell. The New Year's Day Mystery Quilt Group had a great showing (Charlotte's shown here). And lots of other members have been busy quilting since the last show in November. It was great fun to see everyone's work. Click the link above to see the all the quilts! Jen Sorenson brought her Trunk Show to the second meeting. Her blog is A Quilting Jewel. 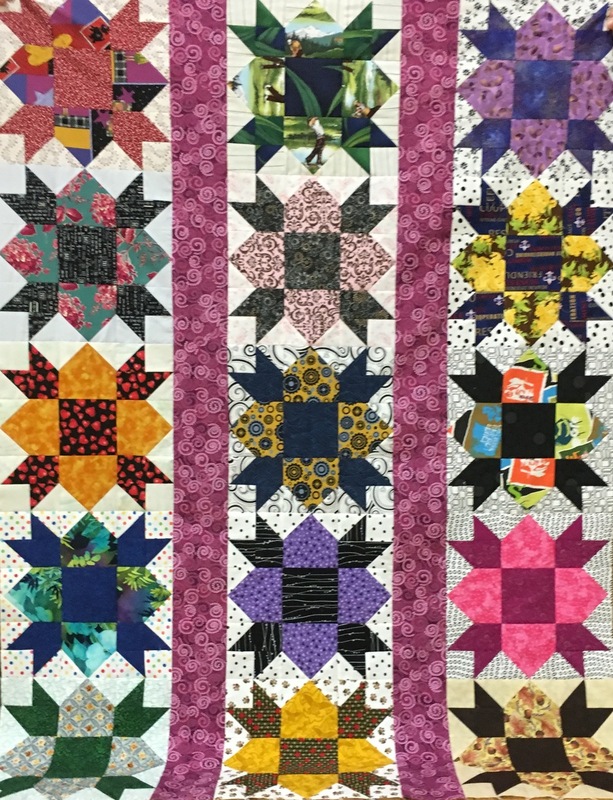 If you were unable to come to the meeting last night, you can see many of the quilts she talked about if you scroll down through the recent posts in her blog! She is a modern quilter and is one of the founding members of the Boston Modern Quilt Guild. Jen had some great tips about doing quilting. Jeannette asked how she did her straight line quilting. Jen explained that she always quilts in the same direction. When she ends a row, she goes back to the end of the quilt where the last row started. She said that seems to cause less puckering than going back and forth...and her long-arm quilting machine prefers to stitch going one direction more than the opposite direction! She really enjoys doing paper piecing, especially discovering secondary patterns when assembling the quilt blocks. She brought a number of her patterns which where were available for sale last night at the meeting. The patterns are also available at her Pattern Store on Craftsy.com. In the photo below, Jen is showing a paper pieced block which she down-sized for corner blocks in her quilt. February is right around the corner! One of the major focuses in the guild will be making Charity quilts. Kace needs to get all the Comfort Quilts for the daycare done by March! We will be having a Sew-In at the next meeting. In the meantime, if you want to start working on a charity quilt, mosey over to the Charity Quilt page to see the quilts that have already been made. We've just added a great link with a lot of patterns for charity quilts collected on the blog Sewn by Leila. At least 2 members have already made quilts from these patterns! Check them out! See you next month! Kace will have on her cowboy hat, feel free to dress up if you wish to!